Several months ago I began a painting in the mountains with watercolor and no subject. I wish I had a photo of that, but I wasn't taking as many step-by-step shots then. I brought it home and it sat for a week. Our first stop at the local farmer's market is always Marcia's Cut and Carry Bouquet's. She knows us and our particular tastes in all seasons and usually has a bouquet or two made with our colors and favorites. We buy a bouquet and several large, loose specimen flowers (sunflowers, irises, gladiolas, dahlias, hydrangea, etc. depending on the season) pretty much every week. The painting and one of Marcia's bouquets, full of mixed coreopsis and rudbeckia, collided in my mind this particular Saturday. I drew blooms loose on the painting, using prismacolors, verithins, and perfettos. 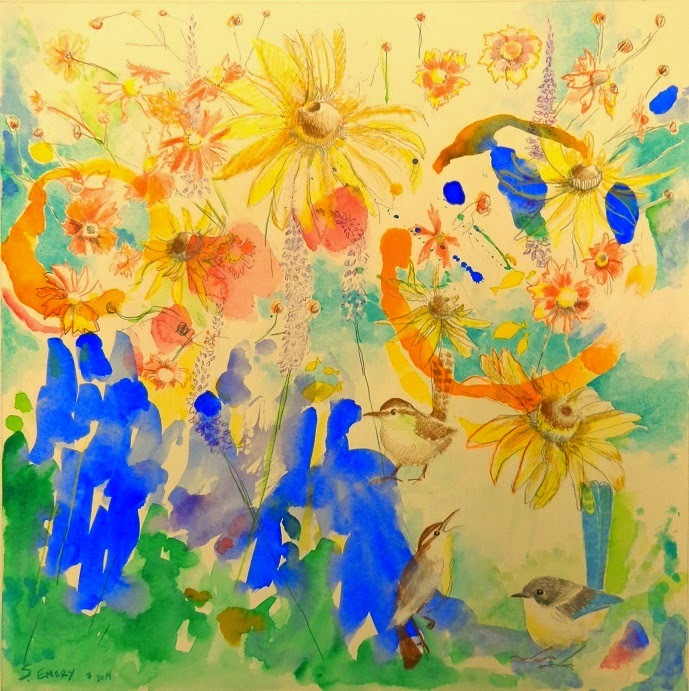 I added wrens, which are in our gardens year round and (with crows) are my favorite birds. Then it sat for several months while I tried to decide how to finish it. The final version just needed the band of lighter blue that runs through/behind the orange circles. I made other adjustments, but they were minor. I finished it this weekend. This keeps the fresh joy that was my goal. I don't usually paint flowers, but I sketch them fairly often, and I've gardened since my teens. I love plants and flowers for their names as much as for their beauty, variety, and changes through the seasons. Watercolor, pencils a little acrylic, and maybe some ink (I don't recall - but I think some red ink...). In the original the ultramarine blue (lower left) is not so intense, and is a little darker.